It’s hard to believe that the Nike Free franchise has entered its 11th year, but the barefoot-inspired series is enjoying more fans than ever with the introduction of the Flyknit upper and an update to the sole unit. From the moment I tried on the Free 4.0 Flyknit, I did not want to take it off. I’m hard-pressed to think of a shoe that works more synergistically with my foot than the Free 4.0 Flyknit. 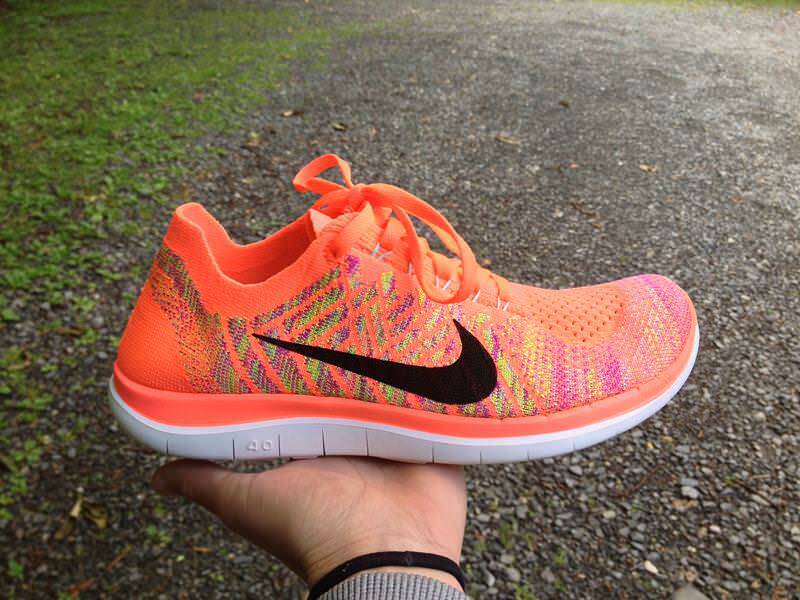 The Free 4.0 Flyknit is the intermediate offering in the Free progression of natural ride shoes. It offers a barefoot feel but with enough cushion to make the ride quite comfortable even over gravel roads. The addition of the Flyknit upper and a redesign of the outsole structure are the most significant changes to the Free 4.0 from previous models. The use of Flyknit technology leaves the shoe lighter and Nike claims to have reduced waste by 2 million pounds since switching to the Flyknit manufacturing process on all their shoes that employ the Flyknit. 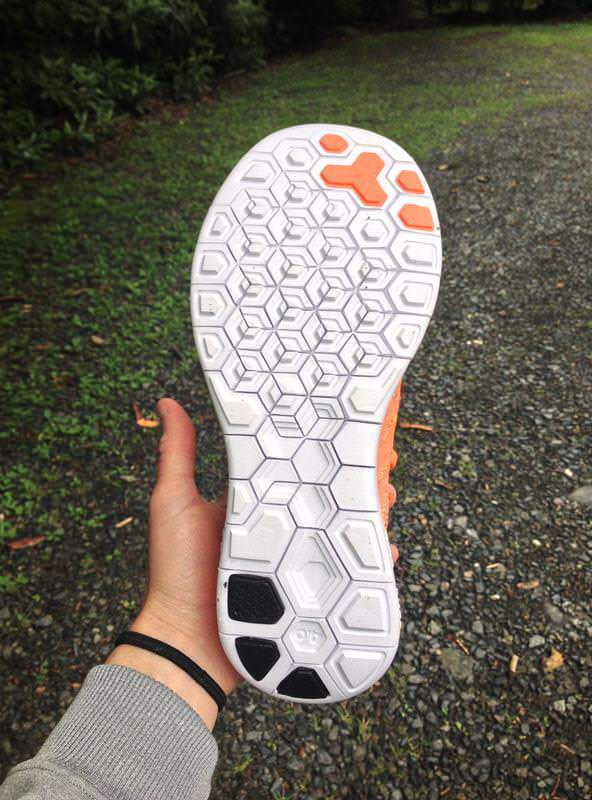 The outsole now boasts hexagonal flex grooves in order to allow for more complete range of motion. These shoes run true to size and are recommended for runners with a neutral foot-strike. The Free 4.0 Flyknit, like their predecessors, come in a range of eye-catching colorways. The second I got these shoes on my feet (sockless as they are intended to be worn) I was immediately impressed with the feel of the Flyknit upper. Like a favorite pair of socks, the Flyknit is snug, but with enough elasticity to allow my foot to move freely and my toes to splay naturally. Having never worn Nike Frees before, I was surprised at the softness. 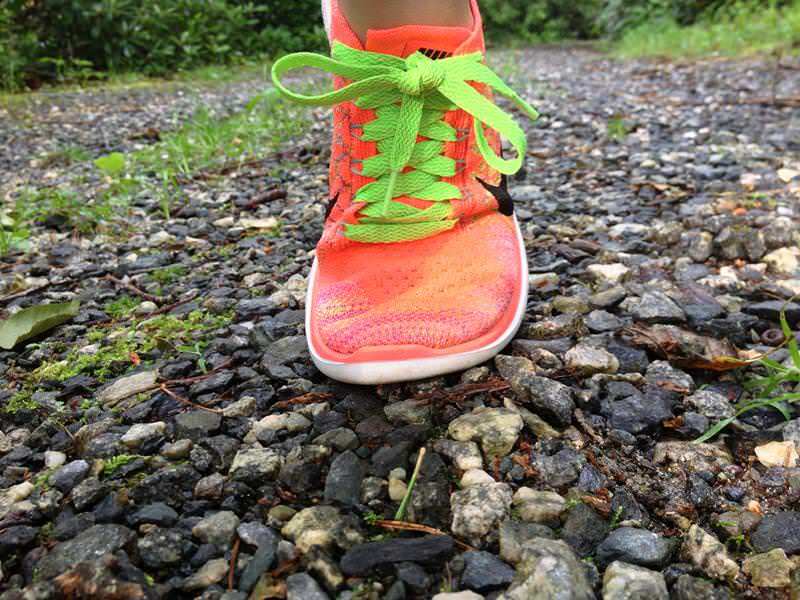 I have run in several minimalist shoes on the market that offer so little in terms of cushioning and shock absorption that I could hear every step as my feet slapped the ground. This is not the case with Free 4.0 Flyknit which offers the softness of a slipper in a running shoe. My first run in the Free 4.0 Flyknit, I did notice that the tag is stitched into the underside of the sockliner and I could feel the seam underfoot. It seems silly that after all of Nike’s effort to produce a truly seamless upper, they would stitch the tag into the shoe. After that initial run, I removed the sockliner, carefully pulled the tags out and have not had an issue since. Perhaps in the next rendition, Nike will print or glue the tag. As mentioned, the Free 4.0 has enough structure underfoot that I could comfortably wear the shoes over gravel roads without any discomfort from rocks and have found that they perform as well on gravel as on the road. 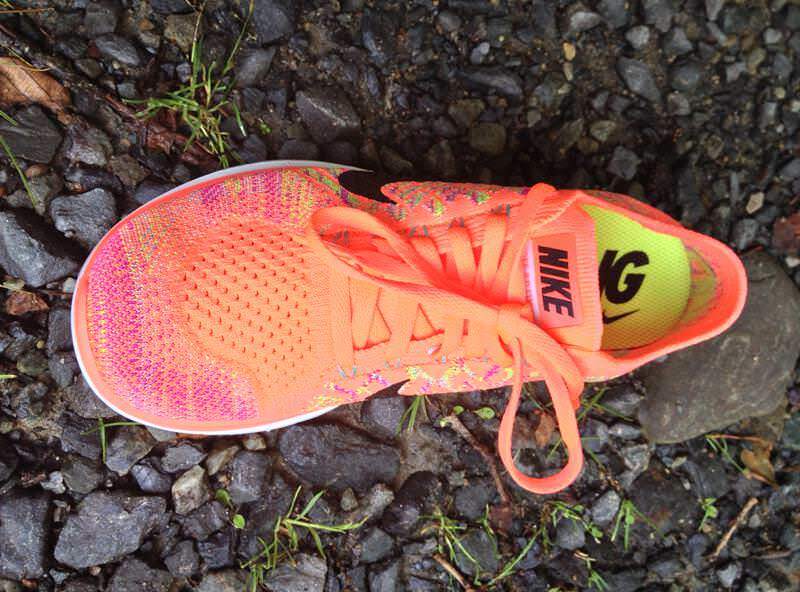 I have enjoyed quicker runs in the Free 4.0 Flyknit and daily training runs. They are not ideal if your legs are feeling flat or worn out the day following a hard effort or a race. The hexagonal design of the outsole allows fuller range of motion and is intended to mimic the foot’s natural and slightly lateral roll as it strikes the ground. I see the hexagonal pattern as a significant improvement over the original rectangular flex pattern that did not resemble the foot’. The sole is constructed of Phylite rubber foam that provides ample cushioning without weighing down the shoe. The Free 4.0 becomes slightly more rigid at the midsole where the foot is less flexible. Additionally, solid rubber overlays can be found under the big toe and outside of the heel. This provides improved traction and durability at contact points. The remaining exposed Phylite, however, does exhibit visible wear under the ball of the foot. After only 20 or so miles, I detect parts of the hexagon nubs deteriorating somewhat rapidly. I do not expect to safely get more than 200 miles out of these shoes which is not a problem per say, but at $120 a pop, I would expect shoes that last longer. Time will tell. The Flyknit upper has been, hands down, the most remarkable component of this shoe for me. It is undoubtedly the most comfortable upper I have found on a shoe. I have never worn socks with the Free 4.0 Flyknit because there is no reason to, and I’m not sure I could find socks thin enough to fit in the shoe. The Flyknit upper is your sock. 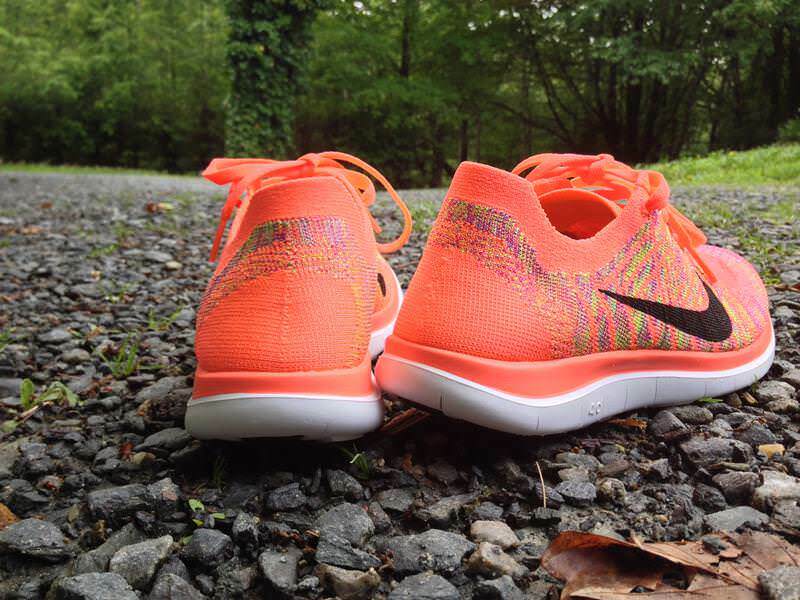 Flyknit offers support and flexibility in one layer. The Flyknit feel is certainly a unique sensation, but is by no means constrictive. The heel unit is non-stretching which helps keep the foot securely in place. With a slightly looser weave than previous versions, the Free 4.0 Flyknit is a bit more breathable. Even so, I am curious to see how they hold up to odor as I rack up the miles in them. Flywire, used throughout the upper, keeps your foot secure and eliminates any slippage within the shoe. The laces of the Free 4.0 even employ Flywire for just enough give. The toe-box is comfortably wide. Run after sockless run, I never experienced any irritations or hotspots in these shoes. 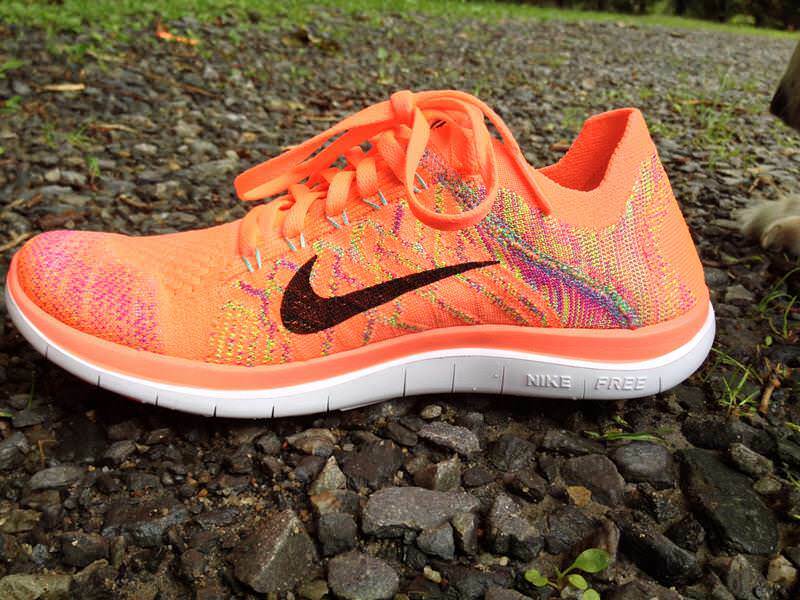 The Nike Free 4.0 Flyknit is worthy of a spot in your running shoe arsenal. As a lightweight, minimal option, this shoe can be used as a training tool for building foot and lower-leg strength. It also has enough cushioning underfoot to serve as your daily go-to trainer. Aside from true recovery running on tired legs, I wear the Free 4.0 Flyknit on a variety runs over paved and unpaved roads and thoroughly enjoy these shoes. I love the fact that I never have to worry with socks! We thank the nice people at Nike for sending us a pair of Free Flyknit 4.0 to test. This did not influence the outcome of the review, written after running more than 50 miles in them. You can but I would rather not due to the minimal protection. It is however very good from 5K to 15K..very fast! overall the shoes preforms well and they’re undeniably comfortable. 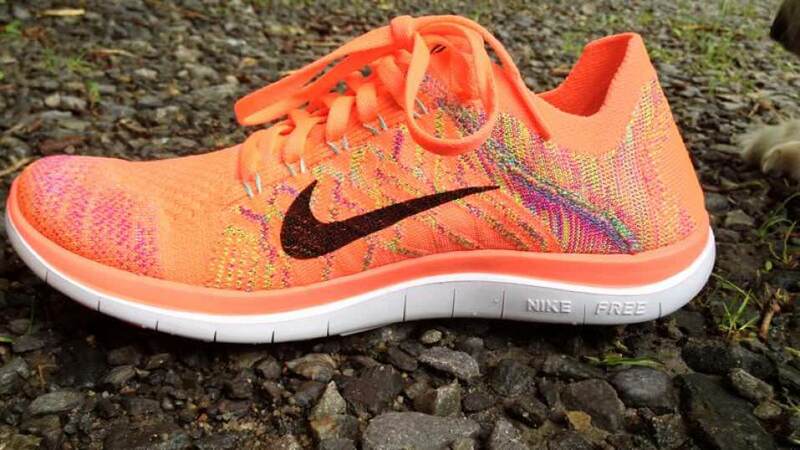 The upper Flyknit fabric works really well and looks cool. Having said that i felt let down by the cheap foam rubber molded sole which could be coincidentally better given the price, on that premise i can’t justify the price. Sadly I wouldn’t buy them again. Nice shoe and very comfortable for shorter distances only (for me), but there is simply nothing to justify the price. It is essentially a slipper – there is no technology – just a nice, knitted upper on a single-density midsole, with flex cuts marked into the bottom. It should cost £/$40-50 max. For that, I give it a 2. Not too sure about the durability for running as I usually run in mizunos and hokas. But I can assure you that the durability is outstanding for an everyday shoe. I’m a nurse and wear 4.0 flyknits at work – I probably cover on average 12kms a day just at work and my first pair have held up for 3 years. I also wear them to the gym and in the yard. I have just replaced them but I could probably push them for another 6 months if I wanted. I bought these on a whim, on clearance sale, not expecting much, not being a Nike wearer (but for >$50, who could pass this up?). What I found was the most comfortable shoes I can ever remember wearing. They are truly like socks, with enough underneath to protect my feet. They are the only shoes I am really comfortable wearing sockless (though I do tend to notice the small pebbles and too much dirt that get in the shoe when I do go sockless). They are a fast shoe. Not sure what’s the farthest distance I’ve worn them for, but I’ve worn them for half marathons with no problems. At the time of writing this, I have over 800 miles in these shoes. The soles are visibly worn and some of the stitching is coming undone, but that’s it. The one thing I dislike is that I am constantly getting small stones stuck in the sole, especially between the hexes toward the heel.